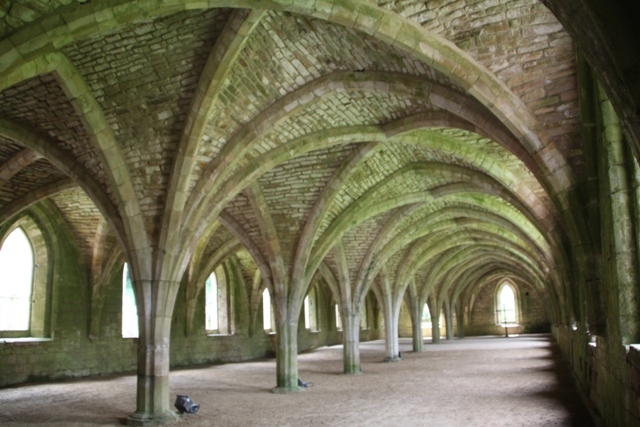 Fountains Abbey has been on my radar for years, finally we made it. Easy to find, not far from Ripon in North Yorkshire, I expected some nice ruins and peaceful countryside – that I got but a stack more besides. 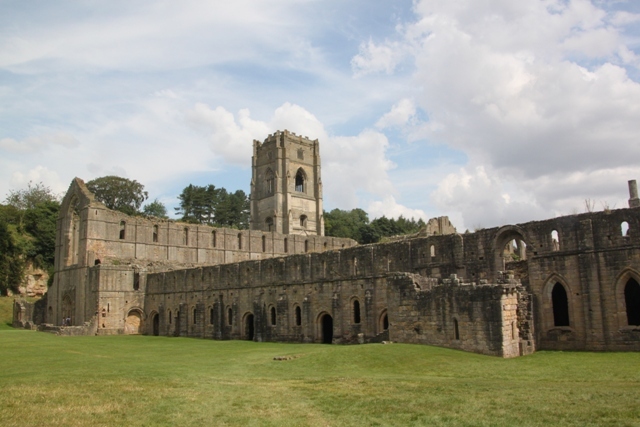 A UNESCO World Heritage site, run by the National Trust, the Grade 1 listed abbey is one of the largest and best preserved Cistercian monasteries in England. These are for sure some of the most extensive ruins I have ever seen. Built in 1132 this was a thriving place until Henry VIII came along and plundered all the good stuff. We parked up, had our picnic and set out to explore. The car park was packed, no problem though, the grounds are so enormous everyone gets absorbed. If you want a quiet corner there are no end of them to be had. 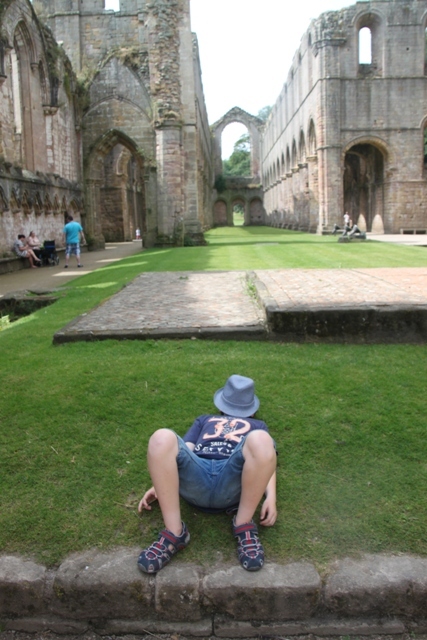 Son wanted to linger in the gift shop (before we’d even started), we dragged him out and headed to the abbey. 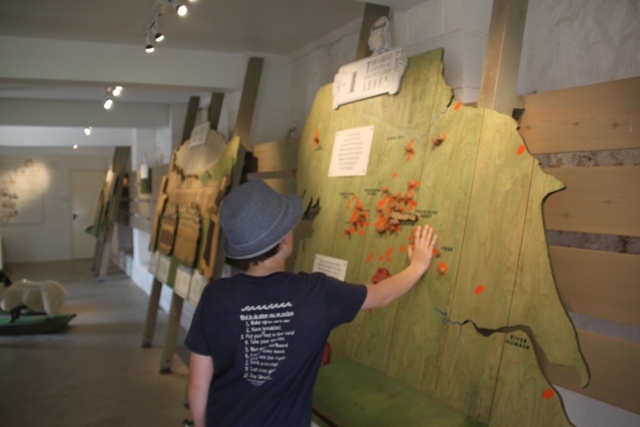 A gorgeous 15 minute walk, en route we passed a barn with children’s craft activities underway and had a peek inside. Next up the Porter’s Lodge with an excellent exhibition all about the abbey, great if (like me) you didn’t know much about its history. Plenty of information and hands-on stuff for children too, it was perfect for us. Adults could read at their leisure while children remained entertained and absorbed, not just all about dashing to the next place. 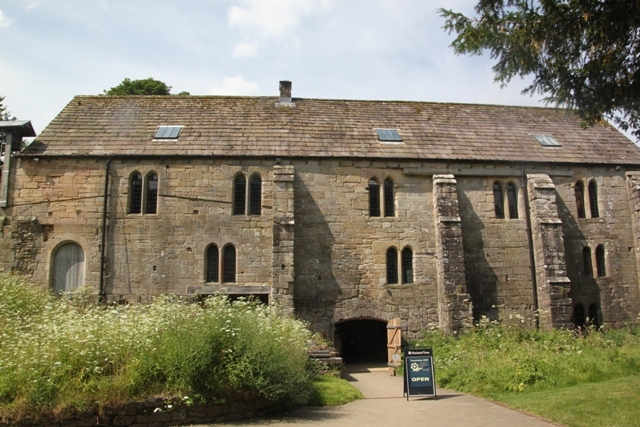 The lodge was once the gatehouse to the abbey, they have a great display on how the monks lived which really sets the scene for those ruins. The ruins are extensive, huge and mind blowing. Some bits are complete ruins, others are perfectly preserved. There are guided tours throughout the day, our timings were out but I wish we had managed to take a tour. We caught the tail end of one, the guide was so entertaining and interesting, even Son admitted this would have been fun. Maybe next time…… The ruins are very atmospheric, you can almost feel the ghosts of the monks still going about their business. 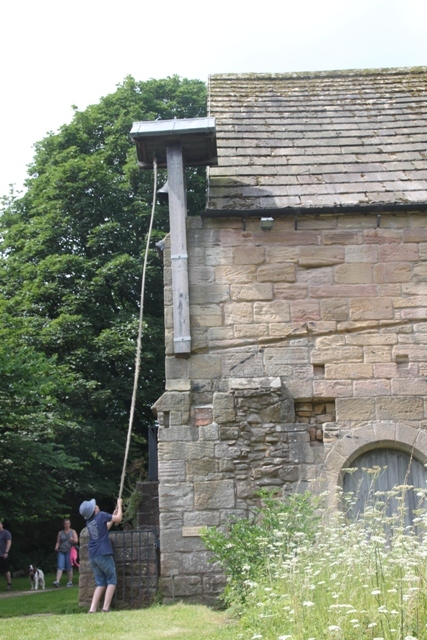 Son loved Fountains Mill, built in the 12th century by the monks, it continued to function until 1927. 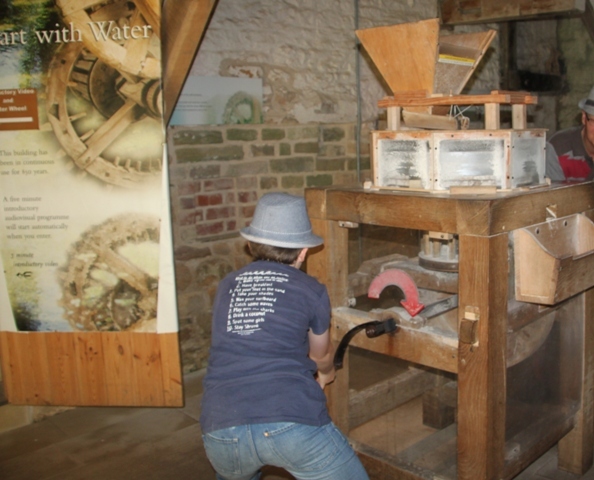 We watched a very child-friendly video about the history of the mill, found more interactive stuff and tried our hand at grinding grain – backbreaking work. There’s a waterwheel to watch and upstairs a fascinating display set up like a dinner table showing the types of food and beverages the monks enjoyed. 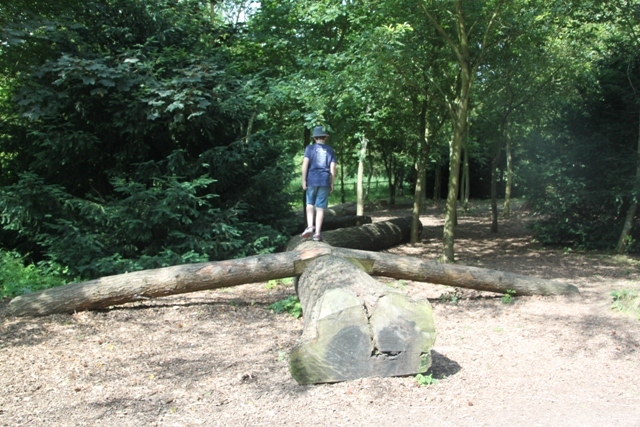 We spent a while in the adventure playground after all that history and grain grinding – made of timber it’s top notch. Much jumping, balancing and swinging went on while Husband and I chilled out. 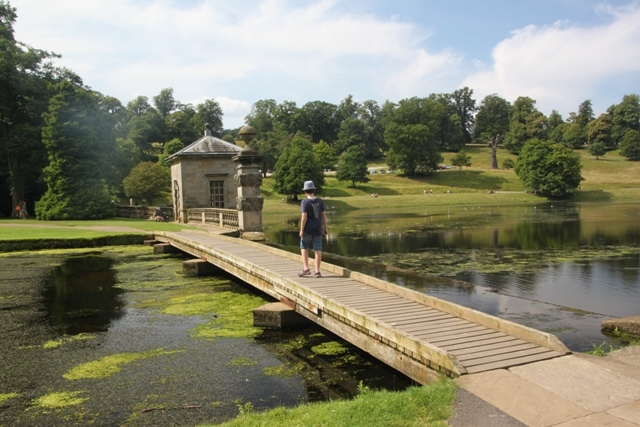 Later in the day we bypassed the ruins, strolled along by the river and made our way to Studley Water Gardens. 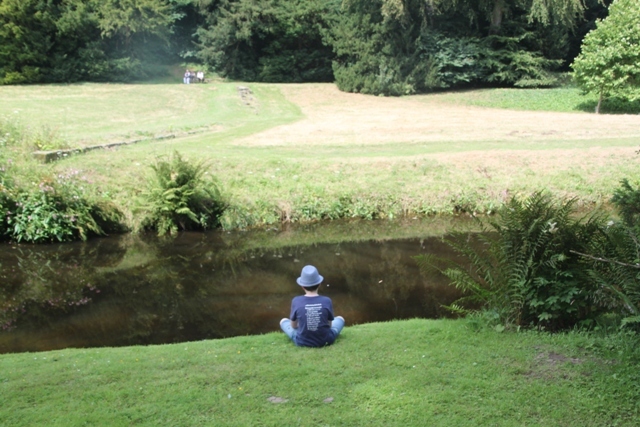 This is a lovely wooded valley which, in the 18th century, was turned into spectacular Georgian water gardens. Son could take or leave the water, but he did love the Follies. 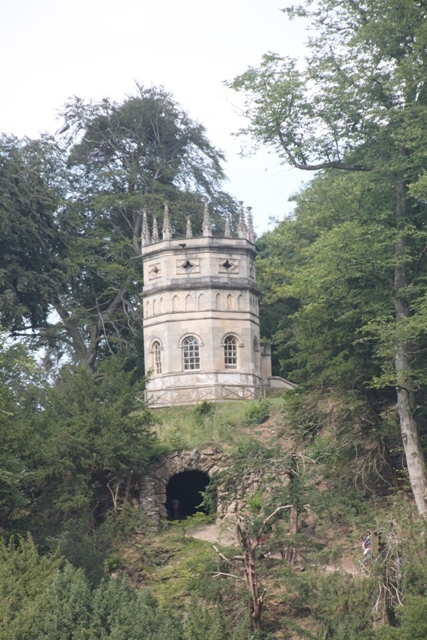 We walked the Folly trail and found a whole series of quaint buildings with breath-taking views – even a tunnel to go through right at the end. The water and ponds looked a bit murky, we didn’t spend too much time there but found the most gorgeous tearoom at the edge of a lake. 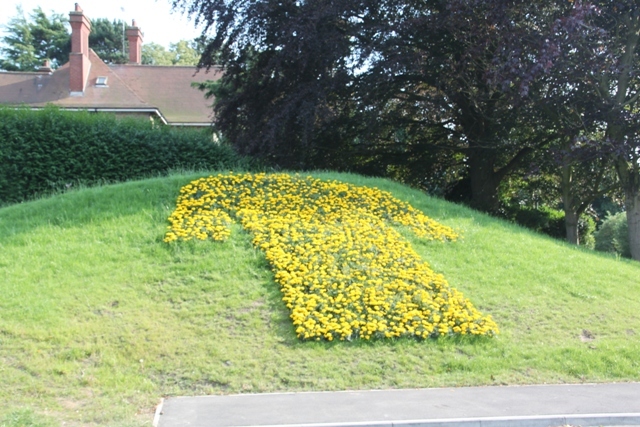 On the way home, unplanned and unexpectedly we drove part of the Tour de France cycle route. Not quite the peloton passing through, but easy to imagine the electric atmosphere when this did happen. Yellow bikes everywhere, villages decked out with (knitted) bunting, yellow flowers in the shape of that jersey, it was fabulous. Many picture stops from us – wish we had been there when the real thing was happening, Yorkshire must have been buzzing. It is wonderful Suzanne, definitely deserves a place on that list!! 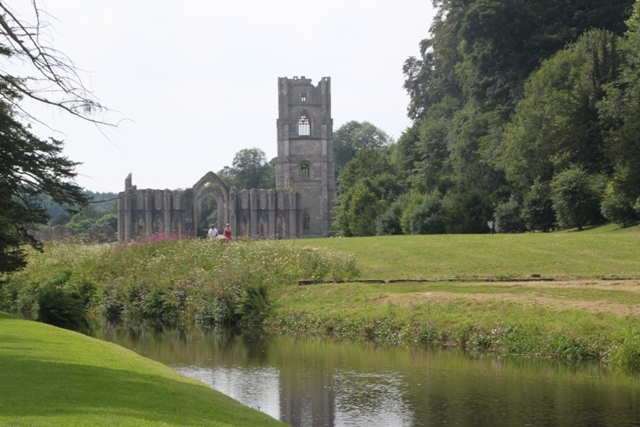 I adore Fountains Abbey. 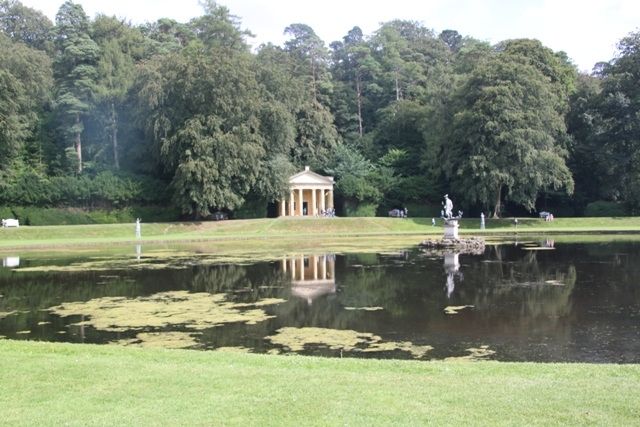 We also walked to the tea room on the lake the last time we were there. It looks like you had good weather for it too! The weather was glorious that day Margarita – blue skies and sunshine all day long. Loved the setting of the tearoom and just loved the whole place really! We’ll be back. 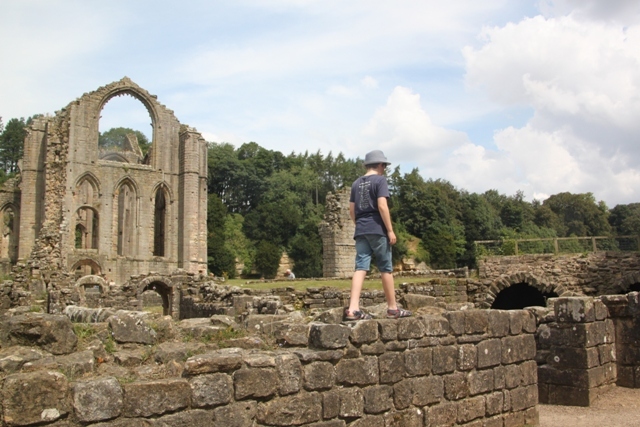 I was so impressed by Fountains Abbey Rosemary – can’t believe it took us this long to go there! We often have those conversations about how they built these magnificent places without modern tools – so much is still standing here too, it’s incredible. We liked the look of the restaurant – didn’t have time to try it but a good excuse to go back! Enjoy your weekend too. 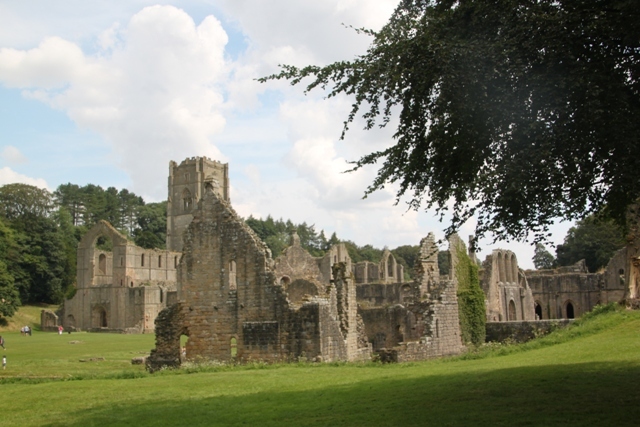 The ruins at Fountain Abbey are one of our favourite destinations in that area of Yorkshire too. My kids loved all the same bits that your son did. 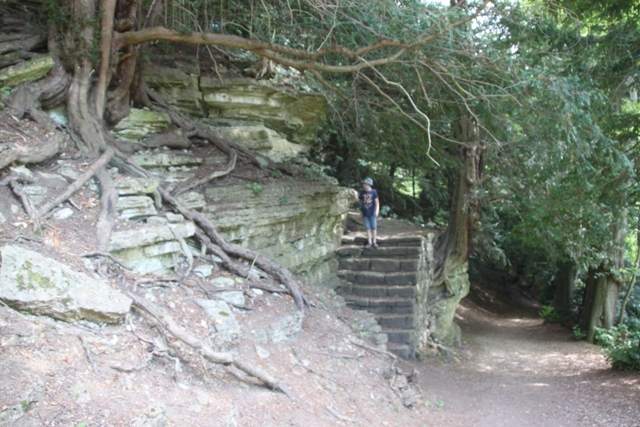 Such a great place – we had a fantastic day out there and would definitely go back. Something to keep all members of the family happy, always makes for the best day out!! Have a great weekend. Me too – these ones are something else!! I follow another blogger who lives in this area and she did a number of posts about the Tour de France being through there–it sounds like an amazing scene. 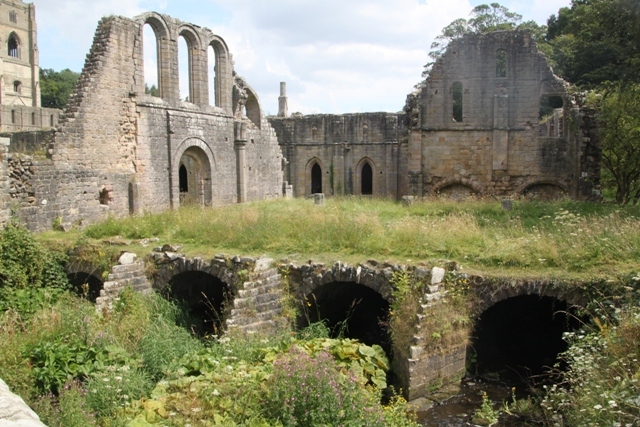 The Fountain Abbey looks absolutely fascinating! 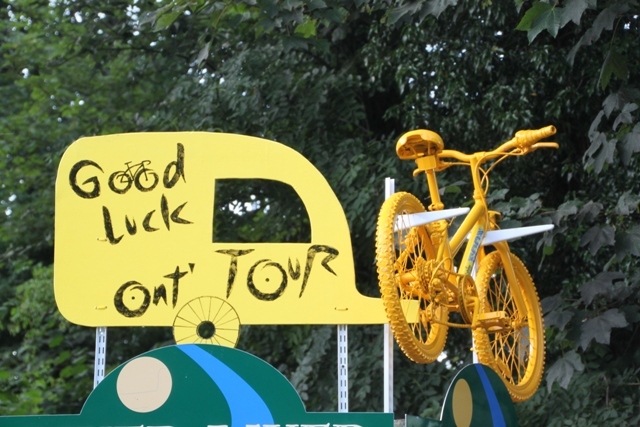 I wish now we had been able to be there during the Tour de France – the effort all the little villages had gone to make their streets stand out was just wonderful. The atmosphere must have been electric. 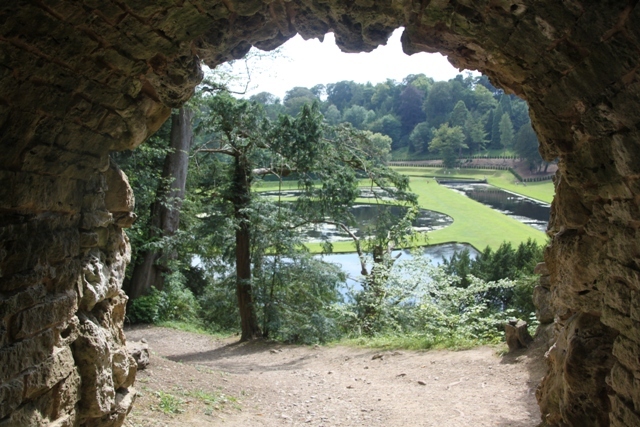 Fountains Abbey is a wonderful, special place – history and great scenery all mixed up together, perfect! I enjoyed reading this and looking at the pictures, I love Yorkshire and this gives me another good reason to return there one day for a holiday! 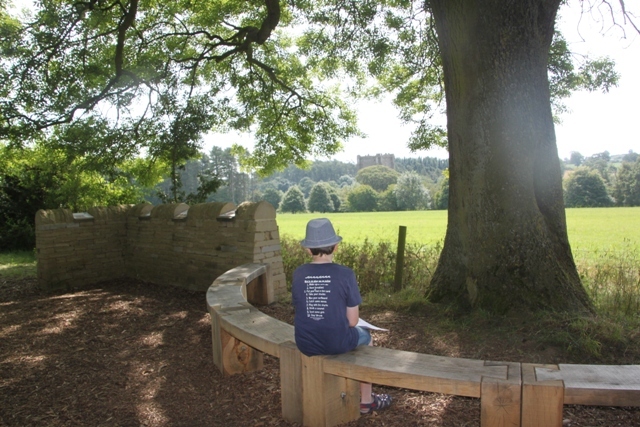 Thanks Chris – it’s a gorgeous spot, well worth a trip to Yorkshire! It is – definitely some of the best ruins I’ve seen!! I always enjoy reading your posts! Sound like an amazing place. I also find it interesting that the ruins you visited were thriving, inhabited, and vey much alive at about the same time as were ruins we visit in our part of the world. However the ruins we visit are primarily Anasazi (now called Ancient Puebloan) cliff dwellings, massive canyon ruins, and remote outposts. Very different! I love the sound of your ruins – cliff dwellings and canyon ruins sound completely amazing and so different to what we can see here!! That said, these were very impressive and the scenery around is so beautiful it made a very lovely day out for all of us. It was a couple of weeks ago – the weather was nice then, an Indian summer but no chance for shorts and t-shirts right now!! Autumn has arrived with a vengeance. It is a great spot for a great day out! Have a nice weekend. That explains the clothes! We’ve had a huge change in the weather in two weeks too. I really enjoy reading all your posts. This looks like a fabulous place to visit! 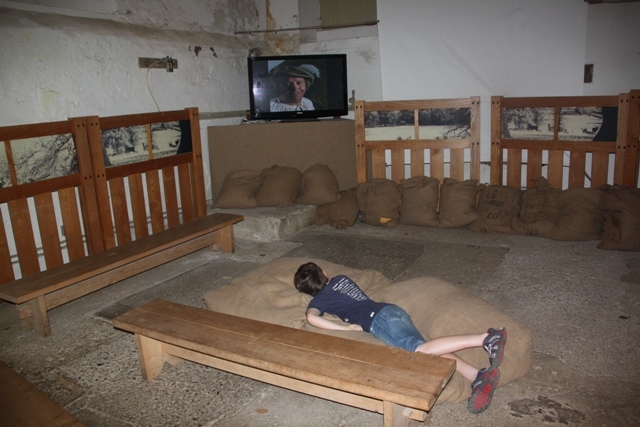 Thanks Kirsten – it is fabulous, ruins, history and lots of kids to do as well, the perfect family day out. Loving your posts too – your Wednesday challenge always has me stumped though!! Absolutely Jenny – I don’t mind very cold, very hot, blustery showers etc – but not all in one day, that’s the big problem with English weather!! Oh I get that! 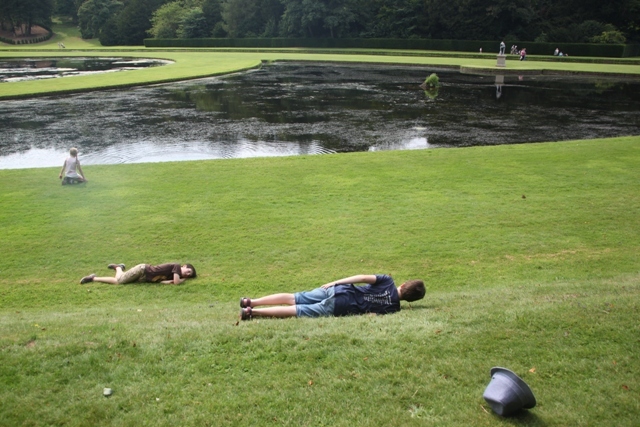 Some of us were more interested in rolling down the hills than anything else!! Monks were very much further down the list. Rolling down hills! 🙂 I have pinned this for later… in case! 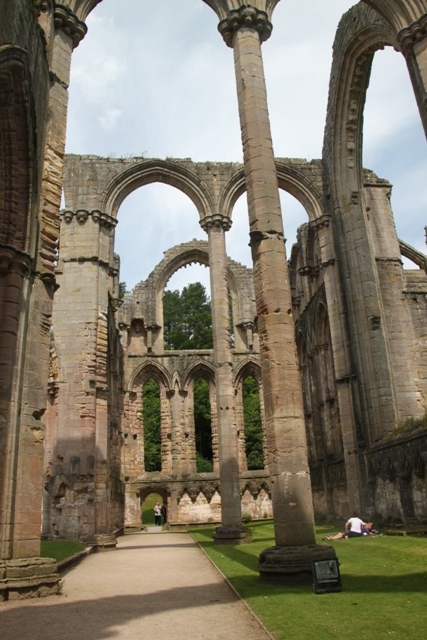 I hadn’t expected Fountains Abbey to be as beautiful as it was. I was traveling with a friend who doesn’t walk well, so I discovered that they do their best to make it accessible. A small bus makes regular runs from the main entrance to a lower gate, opening up an area that would otherwise have been inaccessible. I know what you mean Ellen – we were blown away by the beauty and just how much there was to see. Having read about it beforehand I was still blown away. Great idea with the bus too, it would be a long way to walk if you had mobility problems for sure. 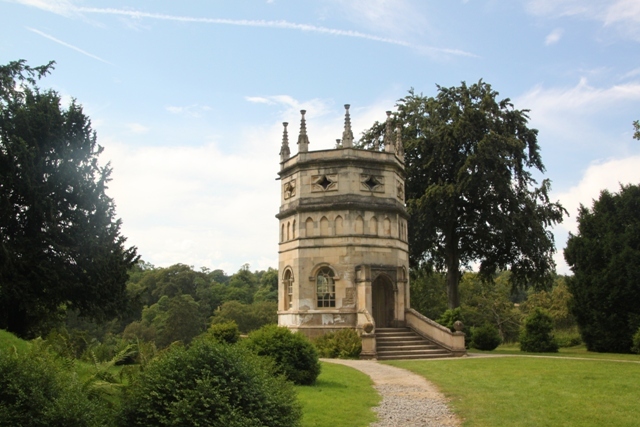 It is – lovely countryside and fascinating ruins, it was a wonderful day out. Thanks for visiting my blog Joy. 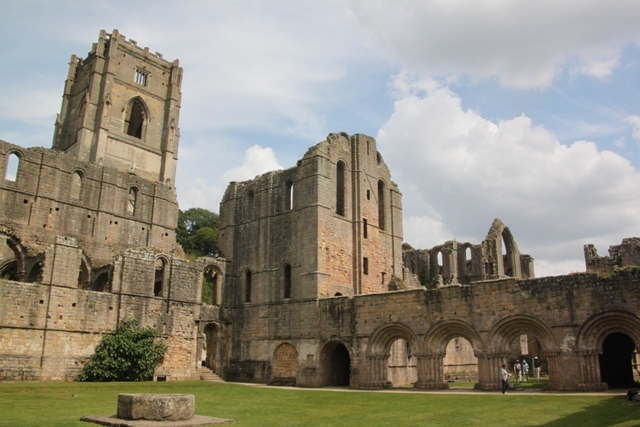 Fountains Abbey is quite local to me but I haven’t been in ages – admission is quite steep if you’re not a Trust member. I remember my favourite bit was wading through a tunnel where the river flows, and spotting water voles kicking through the stream with their webbed feet. Thanks for dropping by here too Ben! I know what you mean about admission – I noticed it was really expensive, we’re members of the Trust and definitely get good value for money, particularly in summer! !